Aphid is a common pest of houseplants. Most often it affects juicy, "tasty" plants, prefers young leaves, shoots and buds. Live in large colonies, causing significant damage to the plant. Absolutely incomprehensible way these insects infest on your favorite home colors. One has only to clean the plants from this pest, as just a couple of days they appear in the same place, in the same amounts. This is understandable - aphid reproduces rapidly, one species lays up to 25 larvae per day. Apply pesticides in the home is not very desirable. Meanwhile, there are simple, organic ways of dealing with these pesky insects. If aphids a bit, you will just need a regular wash plants. But in advanced cases it does not help. Here are some recipes organic solutions for spraying. In each solution, it is desirable to add soap at the rate of 3 g per 1 liter. Spray the plant and soil daily for two weeks. This time should be enough for the vermin. 1. Aphids afraid of onions. Raw onions about 30 grams to grind and infuse one liter of water during the day. 2. A decoction of yarrow is another effective tool. To prepare you need to take 100 grams of dry herb tasyacelistnika, pour one liter of boiling water. Insist during the day. 3. Garlic. 30 g of raw unpeeled garlic minced, pour a liter of water at room temperature. Infuse for about one day. 4. If you have at hand celandine, you can successfully use it to combat aphids. You need to take 300 grams of crude herb, or 100 grams of dry, pour one liter of boiling water. To insist night. 5. Onion peel. 50 grams of peel per liter of hot water. Infuse for 1-2 days. 6. If you have the opportunity to collect fresh nettles, you can use this tool. To make an infusion at the rate of 100 grams of raw herb per liter of hot water. Spray fresh infusion. 7. Red hot chilli pepper - potent agent. 50 grams crushed red pepper pour boiling water in an amount of 0.5 liter, insist night, drain. 8. Soap and alcohol mixture. One tablespoon of liquid soap or dishwashing detergent to combine with one teaspoon of ethanol. Or you can replace the alcohol with two tablespoons vodka. Add one liter of water. 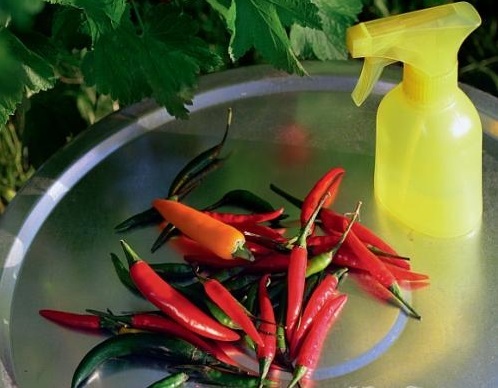 After spraying after 15 minutes tender plants are recommended to be washed with water so as not to burn the leaves.